Makeover Monday: She Shops… She Scores! Previously on Makeover Monday: Last week I told you about the launch of my wardrobe-wide makeover, that will transform my motley assortment into a cohesive collection. My most pressing need is for more professional wear, but I would also like to incorporate additional garments suitable for Argentine tango— without having to create 2 separate wardrobes. Hence my new and ongoing Makeover Monday project: Take Tango to Work! What kinds of pieces would work? Even outside of dancing, I prefer wearing skirts, so I’m starting there. But even with the fashion latitude a creative professional enjoys, I don’t think slinky skirts and dresses are proper. So I’ll look for more structured pieces, meaning made with woven fabrics, including stretch wovens; these materials typically result in a more substantial garment, as opposed to one that would cling inappropriately. Seaming details. The angles created with these sections result in bias draping, which creates such an elegant look (and forgiving fit). On me, this fabulous skirt is close-fitting around the waist and hips, then it has just the right amount of dance-y swing around the knee-length hemline. Work-to-tango outfit 1. Worn with a simple lighter-gray knit cowl-neck shell under my amazing ivory jacket, my gray skirt is work-ready. Then I just need to slip the jacket off (and change into my tango shoes, of course), and I’m ready to dance! 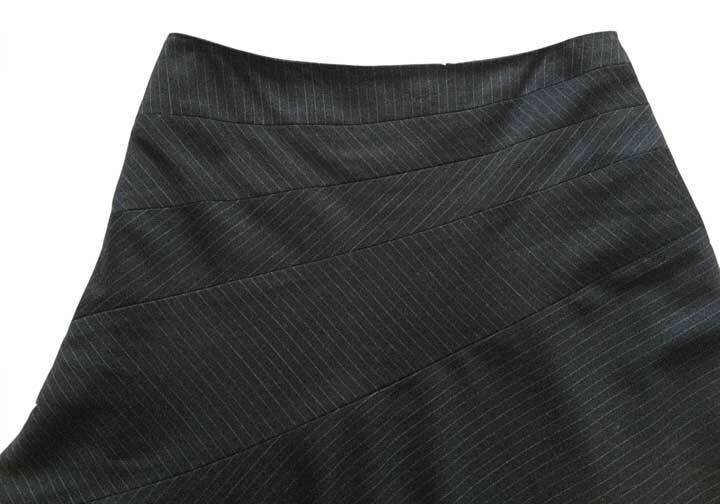 Now I’m starting to get a feel for where I want to go, garment-wise, in my quest for the perfect Take Tango to Work wardrobe: colors and fabrics should be more work-appropriate, and the garment silhouettes (especially skirts and dresses) can be a little more dance-y; this gray pinstriped skirt is a wonderful example of how this balance can be achieved. And no matter where my work takes in me in the course of a day, I won’t have to pack a completely different outfit to go straight to tango! Next Monday, I’ll be focusing on choosing sewing patterns and fabrics to make work-and-dance-ready clothes. And big news! 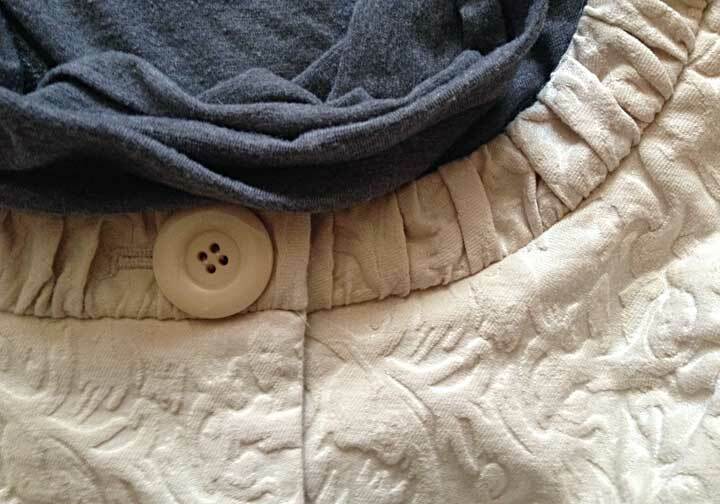 This week, I’ll be starting a new series called Thrift-Shop Thursdays (beginning on, coincidentally, Thursday); this series will start by addressing common issues with thrift-shop finds, from missing buttons to worn-out linings. Later, I’ll be working on some clothes-remodeling projects. Join me on Thursday, and don’t miss next week’s episode of… Makeover Monday! Categories: Fashion, Makeovers, Shopping!, Wardrobe Creation | Tags: clothes, dance skirt, dance wardrobe, fashion, gray pinstriped skirt, jacket, pinstriped skirt, professional clothes that work for dancing, professional image, shopping, skirt for dancing, tango skirt, thrift shop, work-appropriate clothing | Permalink. Yes, this skirt is a definite score! I just finished my tango lesson while wearing it!! 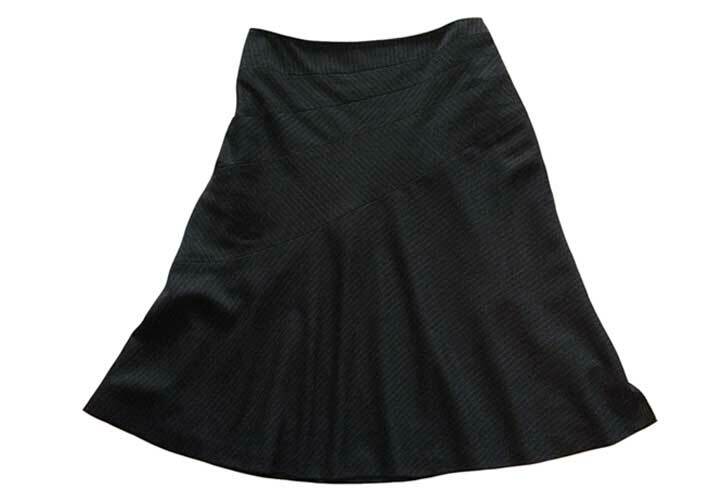 Love the bias and detail design of the skirt – classy look & perfect to tango in = touchdown! I’m so lucky to have found this skirt! I wore it to my Monday class, and it felt really good– easy to move in, light and flowy. It’s wool, but super-high quality, fine-gauge and light, so I should be able to wear it year-round! Thank you for liking my post and following me too!! I really like to do posts that address questions from others, so please feel free to let me know what your specific issues or questions are, okay? Thanks again, Rosemarie!